GATOR-KEY is software-defined UHD keying and branding solution for the Gator platform. Enabling GATOR-KEY allows mixing, keying and logo insertion up to UHD rates. 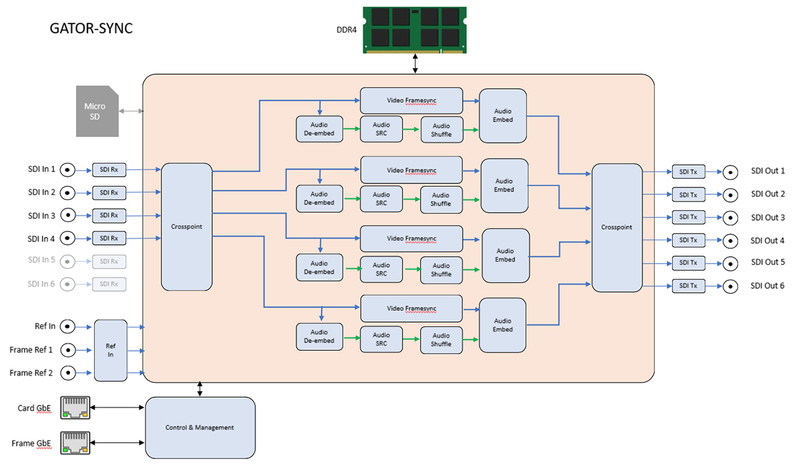 With native 12G-SDI interfaces, you won’t get bogged down with multi-link interfaces in your UHD workflow. This allows easy insertion of external key sources, like Ross’ XPression 4K. GATOR-KEY also features an internal animated logo store; logos can be any size up to full-screen and can be positioned anywhere. This makes the insertion of trouble slides, content rating bugs, station logos and EAS simple and affordable. Using RossLinq, logos can be transferred directly from XPression to Gator’s SD card or on-air framebuffer seamlessly. With GATOR-KEY, Gator offers 6 configurable outputs with selections for PGM / PREVIEW and CLEAN. The look-ahead PREVIEW is ideal for live productions providing confidence in quality and accuracy of the next scene to go to air. GATOR-SYNC software license can be ordered with a Gator card or added to existing cards.